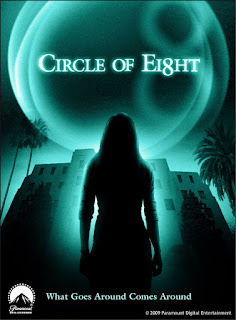 Chances are that if you use MySpace, you've seen the trailer or ads for Circle of Eight. Instantly, this being on MySpace makes you think of a few things. First of all, the Top 8 of MySpace profiles a was a fairly significant thing way back when. Secondly, why is this on MySpace? Third, does this have anything to do with the eight circle of hell, "Malebolge?" Well, all of these things come together in one neat and interesting package. I was lucky enough to be able to preview the first few episodes, play the mini-games and clue hunt before it goes live this week. Keep reading if you want to know what I think so far, and how the whole thing works. Oh, and if you think this has anything to do with the Dungeons & Dragons "Circle of Eight" you are totally mistaken. Circle of Eight is a supernatural murder mystery that is full of WTF moments. Each episode is about 5 minutes long, and they will be served out piece by piece, like a sweet little pie of murder and paranoia. When you first start watching an episode of Circle of Eight it seems like you're just watching any other video online. However, at some point during an episode you'll see a little tool-tip pop up that says something like "Click to go to interactive frame." Doing so will pause the video on a certain image, and this is where the fun begins. As you hunt through the image with your mouse cursor, you'll notice a slightly highlighted area. Once you find it, click, and you'll be shown a stylized image with a call to action to play a little game. This clue hunting game will require you to pass over the surface of Mountain Dew bottle (WTF?!) until you find about 4 clues, including a mobile text number combo to take part in the cell phone clues. The search is pretty easy, but still engaging in that it is more than what most online dramas will offer. The mobile clues are a little strange to work with, and not every phone will have great results, but it is still a cool way to bring you into the world. Wait, yes, there is a world, isn't there? With a story and things, right? Created by some TV veterans, the twisty story with a cast of quirky characters plays like a mix of Clue, Fear Itself, Lost, and Fringe. Oh, and you eventually get some gore for good measure. What starts off with two cops trying to save people from a fire on top of the "Dante Warehouse" on New Year's Eve turns into a story about a woman moving into that very same place. Were the cops in the future or the past? Does the "Circle" include time, never-ending in a strange Möbius strip of overlapping complexity? So far it seems like it might. Jessica, the lead you follow, has just moved into the Dante (hmm, as in Dante's Inferno, with 10 circles of hell?) and is finding out that she has some strange neighbors to contend with. As they bombard her apartment to greet her and welcome her to her new home, you realize there are also 10 people in the building. Just like the 10 circles of of hell in Dante's Inferno... so what happens to two of them? Well, by the end of the 3rd episode, you find out that one is going kaput. Unfortunately, there are only 3 episodes up so far, so you're going to have to wait for the next one to go live! As far as most original web shows go, this one stands out with its interactivity, supernatrual elements, and the overhanging web of intrigue. I'm hooked and can't wait for the next one, but I hope it can keep up with the steam it has already delivered by this point. Go to http://www.myspace.com/circleof8 to experience the insanity!